Ortho• Mind is an advanced formula for cognitive enhancement that contains synergistic ingredients in doses supported by clinical research. It contains R( α ) lipoic acid, acetyl-L-carnitine, citicoline, the Ayurvedic herb Bacopa monnieri, L-pyroglutamic acid and the Asian herb Panax ginseng. Primary Uses: Ortho• Mind is designed to support cognitive performance while protecting against age-related cognitive decline. R( α ) lipoic acid and carnitine support the function of mitochondria, where energy is produced, and mitochondrial density is high in the brain due to its extensive energy requirements. ALCAR is an acetylated form of carnitine that crosses the blood-brain barrier more effectively. R( α ) lipoic acid is also a powerful antioxidant, protecting nerve cells from damage. Citicoline supports phospholipid and neurotransmitter synthesis, both of which support mood and brain cell function. Bacopa monnieri, an herb long revered in Ayurvedic tradition, has been studied for its effects on cognitive enhancement in both adults and children. Both Bacopa and pyroglutamic acid have been shown to enhance learning, information processing and memory. Finally, all of the ingredients in Ortho• Mind have been clinically studied in patients with cognitive impairments, all with positive results. Ortho• Mind is designed to optimize brain function in working professionals or students, aging adults who feel their mind isn't as good as it used to be, or those who require support in a state of cognitive decline. 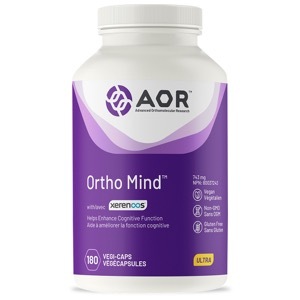 Ortho• Mind can be combined with AOR's Ginkgo Biloba or Vinpo-15 for superior cognitive performance. Take up to 6 capsules daily with/without food, or as directed by a qualified health care practitioner. Methods Find Exp Clin Pharmacol. 1997 Apr; 19(3): 201-10. Fundam Clin Pharmacol. 1990; 4(2):169-73. PNAS. 2002 Feb 19; 99(4): 2356-61. Int Clin Psychopharmacol 2003 Mar; 18(2): 61-71. Psychopharmacology (Berl). 2001 Aug; 156(4): 481-4. Wesnes KA et al. The memory enhancing effects of a Ginkgo bilboa/Panax ginseng combination in healthy middle-aged volunteers. Psychopharmacology, Vol 152(4), Nov 2000, 353-361.